Background: Gastrointestinal cancers make for nearly half fatal cancers with colorectal and stomach cancers' being listed among the ten most common in Iran. 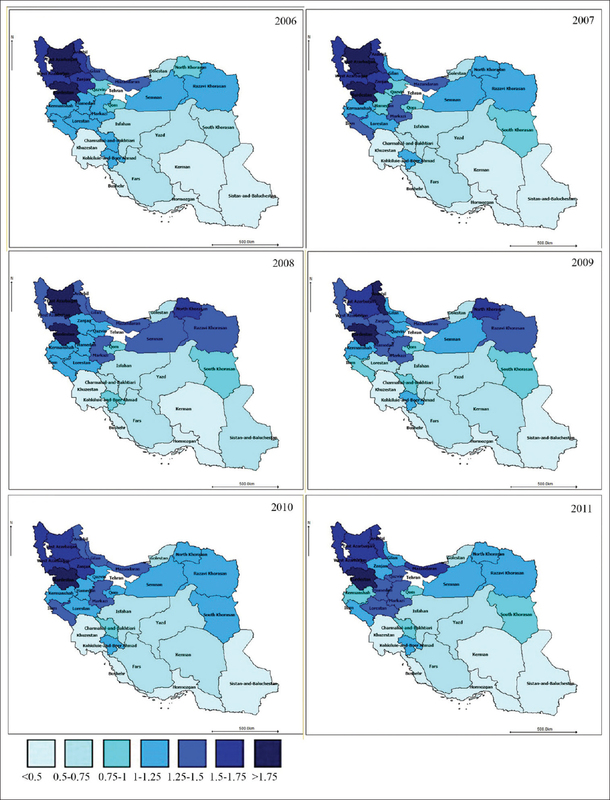 This research aims to determine the spatial pattern and temporal trend of death risk due to colorectal and stomach cancers among provinces of Iran and estimate the effect of shared and specific components as surrogates of risk factors for the aforementioned cancers on changes of death due to the cancers over time and place. Methods: In this ecological study, the data regarding death causes in colorectal and stomach cancers during 2006–2011 were obtained from the death registration system of the Iranian Ministry of Health. The estimation of relative risk (RR) of death due to the target cancers was performed applying Bayesian spatiotemporal shared component (SC) model in OpenBUGS software. Results: North-Western provinces ranked first regarding stomach cancer RR of death (RR >1.75). Furthermore, some North-Western and central provinces had the highest RR of death due to colorectal cancer (RR >1.5). The SC surrogating the risk factor shared between both cancers had the most effect in Northern, North-Western and western provinces, and the least effect in Southern and South-Eastern ones. Conclusions: North and North-West of Iran found to be the high-risk area for death due to both stomach and colorectal cancers and South-East and South provinces shown to have the lowest RR. The obtained results can be illuminating to health resource allocation to the health policymakers. Background: the aim of this study is to evaluate the prevalence and effect of depression and anxiety on the shoulder range of motion, as well as the objective and subjective symptoms in patients suffering from frozen shoulder. Methods: Between 2013 and 2014, in a cross-sectional study, we evaluated 120 patients with idiopathic frozen shoulder. We collected the demographic data for each patient and measured shoulder range of motion in four directions in both limbs. All patients filled out visual analog scale (VAS) for pain and the disabilities of the arm, shoulder, and hand (DASH) questionnaires. Both Hamilton anxiety and depression questionnaires were filled out for each patient. Results: A total of 92 patients (77%) with idiopathic frozen shoulder showed symptoms of depression, while only 32 (27%) of them experienced anxiety. Thirty-two patients (27%) showed symptoms of both depression and anxiety. Although elevation and abduction were not affected by depression, internal and external rotations were more restricted among patients who had symptoms of depression. DASH and VAS scores were higher in patients with symptoms of depression. In terms of anxiety, only VAS and DASH were different between two groups. In multivariable analysis, DASH score was correlated with severity of both anxiety and depression symptoms. Conclusion: While there is no definitive relationship between symptoms of depression or anxiety and shoulder range of motion in patients suffering from frozen shoulder, patients who suffer from depression or anxiety experienced increased pain and limb disability. Background: Lead may be added to the opium by drug smugglers. It can cause elevated blood lead level (BLL) in opium-addicted patients. Erythrocyte pyrimidine 5′-nucleotidase (P5N) activity is susceptible to high BLL. The aim of this study was to find out whether opium-addicted patients show erythropathy and elevated liver enzymes explainable by high BLL and decreased P5N activity. Methods: Forty orally opium-addicted subjects and 40 normal healthy volunteers were enrolled in this study. BLL was measured in whole blood specimens using atomic absorption spectrometry instrumentation. Enzymatic activity, protein amount of P5N, and erythrocyte purine/pyrimidine ratio were determined. Blood films were analyzed for the presence of basophilic stippling of red cells and hemolytic anemia. The level of liver function enzymes was measured. 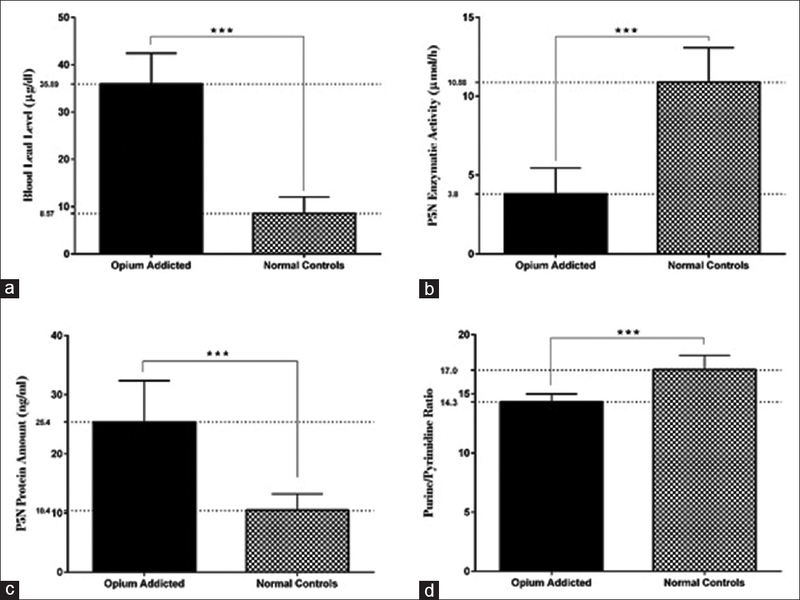 Results: The mean BLL for opium-addicted patients was significantly higher than control group (P < 0.001). On the contrary, P5N activity showed a valid decrease in opium-addicted patients when compared with control group (P < 0.001). In line with repressed P5N activity, erythrocyte purine/pyrimidine ratio in patients was lower than control group (P < 0.001). A statistically significant reverse correlation was found between BLL and P5N activity (P < 0.05, r = −0.85). The prevalence of both basophilic stippling (P < 0.001, z = 6.62) and hemolytic anemia (P < 0.001, z = 6.52) in study population was significantly associated with elevated BLL. We could not find any significant correlation between serum level of liver enzymes and BLL. Conclusions: Opium-addicted patients in Tehran, Iran, are at high risk of lead poisoning which may result in hematologic problems and possibly hepatic damage. Original Article: Simplified algorithm for evaluation of proteinuria in clinical practice: How should a clinician approach? Background: Proteinuria is a common laboratory finding among children and adolescents. It can be identified as either a transient or a persistent finding and can represent a benign condition or a serious disease. Methods: Pertinent medical literature for asymptomatic proteinuria in children and adolescents published in English was searched between January 1980 and May 2017 using PubMed, MEDLINE, EMBASE, and Google Scholar research databases. Of the 64 reviewed articles, 24 studies were eligible for inclusion. Results: Random spot urine protein-to-creatinine (PCR) ratio is widely used to reliably detect proteinuria. The normal value for the spot PCR in children aged 2 years or older is less than 0.3. In children aged below 2 years, the PCR can be as high as 0.5. Orthostatic proteinuria is defined as urine PCR greater than 0.3 detected in a urine specimen during the daytime activity but less than 0.3 on the first morning void specimen. PCR above 3.0 signifies heavy proteinuria as seen in nephrotic syndrome. Orthostatic proteinuria is a frequent cause of proteinuria in asymptomatic children and adolescents, which require no specific therapy except for health maintenance follow-up. 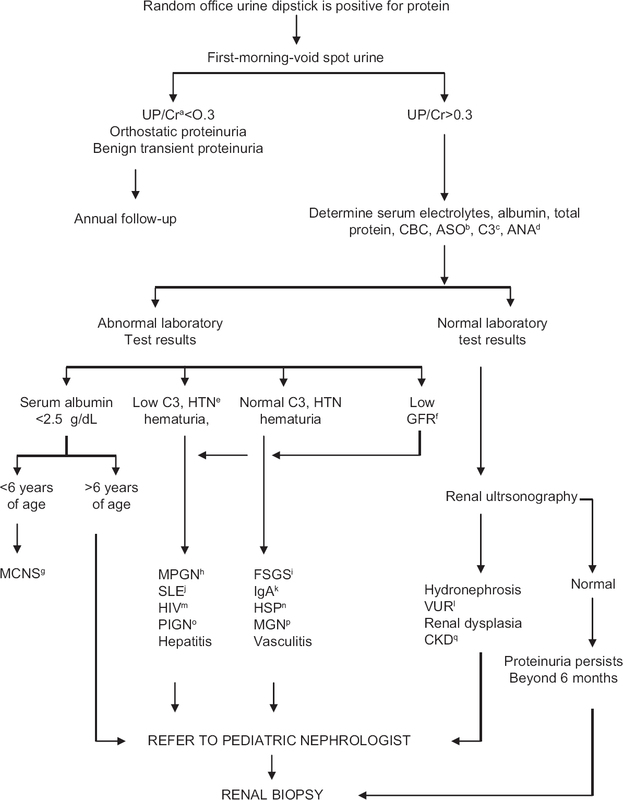 Pediatric nephrologist referral is indicated when the proteinuria is constant and persists over 6 months or is associated with hematuria, hypertension, or renal dysfunction. Conclusions: We provide a simplified diagnostic algorithm for evaluation of proteinuria in primary care adolescents who appear well and in whom proteinuria is incidentally discovered during a routine examination. The low intelligence quotient (IQ) level is one of the most common and important medical, social, and familial problems in all countries. The current study aimed to estimate mean IQ with the Wechsler scale in Iran by performing a systematic review and meta-analysis. 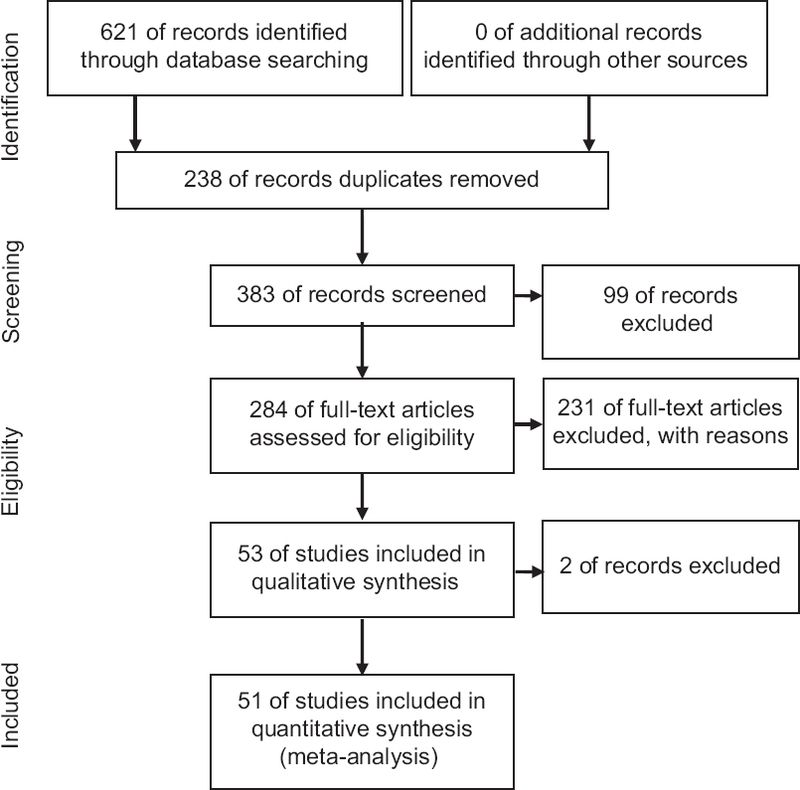 In the current meta-analysis, all articles related to IQ conducted in Iran using the Wechsler scale were deeply searched by reviewing citation databases including Science Direct, PubMed, Scopus, Web of Science, Springer, SID, Magiran, Iranmedex, Medlib, and Google Scholar motor search and using valid keywords without time limits. Due to heterogeneity between studies, a random effects model was used to combine the results of studies. To investigate the heterogeneity of the studies, the I2 index was used. All statistical analyses were performed using STATA software version 11.1. The number of participants in the 51 studies was 5352. The mean total IQ score in Iran was estimated 97.12 (95% confi dence interval [CI]: 88.71–105.52), the practical intelligence was 92.84 (95% CI: 79.14–106.55), and the verbal intelligence was 94.50 (95% CI: 83.90–105.10). The total IQ score in the northern, southern, central, eastern, and western regions of Iran was 97.08, 108.90, 92.31, 101.76, and 96.45, respectively. The mean IQ score in Iran in subjects under 20 years of age is 97.73 and in subjects over 20 years of age is 105.61. There is also no signifi cant relationship between the mean total IQ in Iran and two parameters of the year of research and number of research samples. For prevention of decrease IQ and given that proper nutrition and breastfeeding directly contribute to increase IQ, nutrition should be provided free of charge in poorer areas during pregnancy until baby born. Moreover, the media should provide adequate education for breastfeeding and nutrition, because IQ affects people's academic, occupational, personal, and social performance, and also prevents elite immigration with suitable planning and provides conditions for elites to return to the country. Background: India had highest number of under-five deaths, 1.2 million deaths out of 5.9 million (2015). As per the results from the first phase of National Family Health Survey (NFHS-4), 2015–2016, under-five mortality rate was highest in rural area of Madhya Pradesh (MP), 69/1000 live birth as compared to urban areas, 52/1000 live birth. The objective of the study was to identify potentially high-risk districts (HRD). Methods: This study was carried out from the secondary data of 50 districts of MP State which was available from NFHS-4 with information from 49,164 households. Scoring method was used to identify HRD by comparing variables related to maternal and child health care of rural MP with rural Tamil Nadu. Results: Eleven HRDs were identified with poor maternal and child health care along with high women's illiteracy and high percentage of child marriages in women. Indore division had 3 topmost HRD, Alirajpur, Jhabua, and Barwani followed by Rewa division with 2, Singrauli and Sidhi along with Sagar division. Conclusions: HRDs should be considered for targeted interventions using the strategies for reducing under-five mortality rate in rural MP. Background: Antiepileptic drugs (AEDs) may lead to an increase in the plasma concentration of homocysteine. There is limited information, especially from Iran, regarding the risk in patients who are treated with levetiracetam as a new type of AED. The aim of the present study was to investigate the effect of levetiracetam on plasma homocysteine, vitamin B12, and folate levels in adult patients with epilepsy. Methods: We conducted a case-control study and enrolled adult patients with epilepsy who had received monotherapy with levetiracetam for at least 6 months at some time prior to the study. homocysteine serum, vitamin B12, and folate were measured, and folate and vitamin B12 intake was determined by the food frequency questionnaire (FFQ). Results: Thirty-three patients on levetiracetam and 35 control subjects aged between 18 and 60 years were enrolled. No statistically significant differences in the means of the serum markers of vitamin B12, FA, and homocysteine levels were found between the two groups. In the first model,i.e., the crude model, no significant differences were observed in the serum concentrations of homocysteine, vitamin B12, and folate. In the second model, education was considered, and body mass index and folate intake was controlled with no significant difference being observed in the mean homocysteine serum level. Conclusions: Treatment with levetiracetam in patients with epilepsy has no effect on the serum levels concentrations of homocysteine, vitamin B12, and folate. This medication is suggested for patients who use AEDs on a long-term basis and at high dosages. Background: Caregiver burden is always a neglected domain, and assessment of burden with available instruments developed in one country is neither reliable nor valid because of different cultural, ethical, religious, and other personal values. This study is an attempt to develop an appropriate instrument which can assess the burden on caregivers from the Indian subcontinent and other Asian countries. This work is an attempt to develop and standardization of CBS-IP using content and construct validity. Methods: The study was conducted with a total of 125 (55 – initial interview + 25 – pilot study + 45 – construct validity) caregivers of individual with chronic neurologically ill patients. Content and construct validation was performed as follows: (1) search of relevant electronic databanks and use of experts and caregivers' opinions to prepare appropriate content, review, and correction of the content through discussions with experts. (2) Content validity has been established by computing content validity index (CVI). (3) Construct validity has been established by correlating (Pearson's-r) with another standardized instrument (Eysenck Personality Questionnaire-Revised) using multitrait procedure. Results: Using CVI procedure, scale-level CVI (S-CVI) universal agreement is 0.889; S-CVI average is 0.898. The item-level CVI is 0.90. The Pearson product-moment correlation coefficient (r) was obtained by comparing caregiver burden scale-Indian population (CBS-IP) total with extraversion, r = −0.440, n = 45, P = 0.002; CBS-IP total with neuroticism, r = 0.228, n = 45, P = 0.132; and CBS-IP total with psychoticism, r = −0.011, n = 45, P = 0.942. Conclusions: We believe that the new tool CBS-IP is a good empirical instrument for evaluating stressors on informal caregivers in India and possibly in some other countries in Asia. Original Article: Health services management in Turkey: Failure or success? Background: The unfair distribution and delivery of health-care resources have been recognized as a problem in the worldwide. In the past 18 years, Turkey has undergone rapid social, cultural, and economic changes. The lifestyle and dietary habits of its people have also been changing, and the rates of diabetes, obesity, cancer, and other chronic diseases have increased dramatically over the past two decades. The health transformation program (HTP) has improved the Turkish health-care system since 2003. The main goal of HTP was to progress government, to provide equality between citizens, to give satisfaction to users and providers, and to subsidise the health-care system in Turkey. Aim: The aim of this study is to assess health-care services and health care quality delivery in the Republic of Turkey with special emphasis on governmental hospitals, university hospitals, primary healthcare centers (PHC) and to make comparison with low-, medium- and high-income countries. Methods: This is a retrospective, descriptive study. The ministry of health Annual Reports, websites of the Central Intelligence Agency (CIA), The World Fact Book, organization for economic cooperation and development report, Compendium of Health Statistics, the Google engine, and PubMed were searched for information about Turkey's health-care system and its history. Papers and websites in English were evaluated. There was no restriction on types of articles and sources. Results: Turkey has made outstanding reforms in health status in the last two decades, especially after the implementation of the HTP. The doctor's perception has more influence regarding consultation length and visit than the patient's. The results of consultations in volunteer practices in Istanbul showed that the mean and SD of the consultation length for the whole sample of 360 patients was 7.95 ± 4.38, (with range = 3–25 min). Consultation time has been affected by the patients' diseases, genders that women got longer consultation time, medical practices at the urban or rural areas, and ages which older patients required longer consultation time. The current study revealed that increasing doctor's workload leads to decrease the length of consultations. Moreover, average life expectancy reached 75.3 for men and 80.7 for women in 2015. The infant mortality rate decreased to 10.7/1000 live births in 2015, down from 117.5 in 1980. The leading causes of death are diseases of the circulatory system followed by cancer. Conclusions: The Turkish health system and health-care delivery have been improved over the last decade. Still far from perfect, there is a particular planning to increase medical workforce in PHC including well-trained staffs for a specific area. An urgent need is to acquire more accurate and reliable data from hospital and PHC centers in Turkey. Additional some attempts should be made to assess quality of healthcare in relation to services and process. Background: Sarcopenia describes the inevitable deterioration in muscle mass and strength that accompanies biological aging. The purpose of this study was to investigate the effects of resistance training (RT) on quadriceps hypertrophy and related biochemistry in sarcopenic and healthy elderly men. Methods: A total of 31 elderly men (55–70 years old) were classified as sarcopenic and nonsarcopenic and were divided into two groups. Both groups participated in a progressive RT program for 8 weeks. Results: Data indicated that the strength in the sarcopenic group increased more than the healthy group (P < 0.05). Quadriceps cross-sectional area also increased more in the healthy group (P < 0.05). Myostatin concentration decreased in both groups after training (P < 0.05). Follistatin and testosterone increased in the healthy group; in contrast, only testosterone increased in the sarcopenic group after training (P < 0.05). Conclusions: The findings from this study suggest that RT improves muscle cross-sectional area and biomarker-related muscle loss in both healthy and sarcopenic elderly men. The findings also demonstrate that growth factor profiles at baseline and changes in testosterone levels play an important role in muscle hypertrophy observed in both groups. Introduction: Dental caries and obesity are multifactorial diseases with diet being a common contributory factor. Many studies have reported varied outcomes about the association between dental caries and body mass index. But, there is no published study that investigates this association among female students in Tehran. 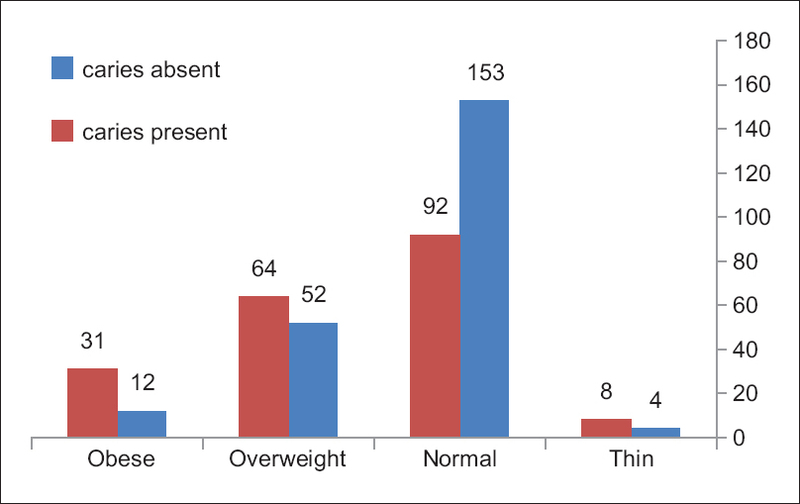 The main aim of this study was to examine the relationship between dental caries and body mass index (BMI) in a sample of female students in Tehran. Methods: In this cross-sectional study, 416 students aged between 10 to 12 years was examined for dental caries using WHO standard diagnostic criteria. The Decayed, missing and filled of permanent teeth (DMFT) were recorded. The student's weight and height were measured by two trained examiner and their BMI were calculated. BMI-for-age and dental caries categories were analyzed with Pearson correlation coefficient, Chi-square, and t-tests using SPSS computer software. Results: The mean DMFT score and BMI of the study population was 1.03 ± 1.41 and 18.11 ± 3.33 respectively. The findings showed that 58.9% of the children had a normal weight, 27.9% were overweight, 10.3% were obese, and only 2.9% of the students were thin when they were compared with WHO standard of BMI for children with the same age. The respective mean DMFT values for BMI groups (thin, normal, overweight and obese) were 1.25, 0.73, 1.42, and 1.65, respectively. There was a significant association (P < 0.05) between dental caries and high BMI. Conclusions: This study demonstrated a significant association between caries frequency with high body mass index. For these reasons, the evaluation of nutritional status in students should be implemented in control programs for dental caries both on the community, schools, and individual levels.